This isn't any ol' bucket hat. 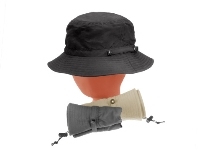 This is a microfiber bucket hat that rolls up and is held in place with a snap strap! It's perfect to put in your beach bag or in your knapsack to carry anywhere. It also has a toggle adjuster on the crown and moisture wicking sweatband for those hot days.